Preschool Playbook: Time to Cook! So today was a day that you have to be mentally prepared for. Today was a total food experience day. 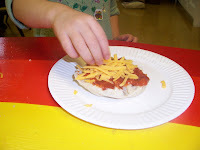 We played with pudding--more information on that in the color post, and we made muffin pizza. There was stuff everywhere. 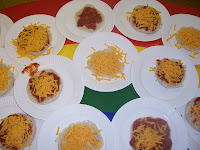 I always love to do some type of cooking activity with the children as they enjoy working with food. Long ago, when we had a little kitchen we made blueberry muffins with them. Then our kitchen got a makeover and now you have to be Einstein to use it. So we try to do things in the room. 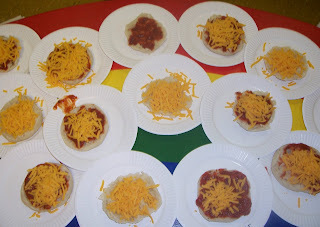 I have done vegetable race cars, banana snow logs, and finally the best to work: muffin pizzas. These are very easy. I gave each child half a muffin. I asked them if they would like sauce, if yes they spooned it out of the jar and spread it on their muffin. Finally, if they wanted cheese they sprinkled it on. 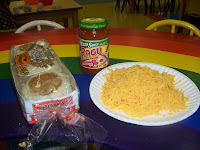 Some of the children only wanted cheese, some only wanted sauce, and some wanted it all. It is great too, these are a snack that most of them actually eat. I always bring my toaster oven to school with me on this day and I cook the pizzas as they children are enjoying the rest of playtime. Then they are cool at snack--mmm, mmm good. I gave the children a piece of cut celery about 3 inches long. They could spread cream cheese or peanut butter inside--whatever their liking was. Then I pushed two toothpicks all the way through. Finally I helped them to put on four carrot wheels. This snack got more action driving around the snack table then down to the belly--they are cute though. The other thing I made was Banana Snow Logs. This is a recipe my 21 year old son brought home from kindergarten. It was a big hit at our house, still occasionally is. I gave the children about half a banana sliced lengthwise. Then peanut butter got spread on it, and coconut sprinkled on the peanut butter(if they liked). Then you rolled the whole banana in the coconut. 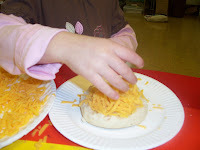 I liked to make slices then and I helped them take a plastic knife and cut it into slices. They actually liked these more than anticipated. I stopped making them though because of the amount of peanut butter allergies. 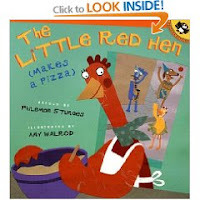 The book we read today was "The Little Red Hen (Makes a Pizza)," retold by Philemon Sturges, illustrated by Amy Walrod. It is a story pretty much like "The Little Red Hen," but she is making a pizza instead of bread. It's actually a little funny. It has more words than I usually read, but the kids usually make it through. I always have them help me when the other animals say," Not I."